YOGA AND AEROBICS THE FOURTH SUB ACTIVITY WAS CONDUCTED IN THE MONTH OF APRIL FOR THE STUDENTS OF CLASS IX. THE ULTIMATE AIM OF THE ACTIVITY WAS TO MAKE STUDENTS, TEACHERS AND PARENTS CONSCIOUS OF FITNESS AND HELP THEM OBSERVE DIFFERENT FITNESS REGIMES BEING PRACTICED IN DIFFERENT COUNTRIES. THEY OBSERVED THAT THE PERIPHERY OF YOGA HAS BEEN STRETCHED TO THE WHOLE UNIVERSE. THE STUDENTS SEARCHED AND COMPARED DIFFERENT FITNESS REGIMES BEING PRACTICED IN UK, US, JAPAN AND INDIA AND TRIED TO IMBIBE THE BEST OF ALL. THE ACTIVITY HELPED ENHANCE GLOBAL OUTLOOK REGARDING FITNESS AMONGST STUDENTS AND TEACHERS. WORKSHEETS UNDERLINING NUTRITION WERE SPECIALLY DESIGNED FOR STUDENTS OF CLASSES II, III, IV AND V. STUDENTS OF CLASS II WERE ASSIGNED WORKSHEETS TO IDENTIFY AND COLOUR HEALTHY FOOD ITEMS COMMONLY CONSUMED IN US, UK, JAPAN AND INDIA. STUDENTS WERE ELATED COLOURING AND DECORATING THE CLASS ROOMS WITH THESE SHEETS. STUDENTS OF CLASS III WERE MADE TO DIFFERENTIATE BETWEEN HEALTHY AND JUNK FOOD IN THE COUNTRIES UNDER STUDY.. WORKSHEETS FOR STUDENTS OF CLASS IV AND V WERE SPECIALLY DESIGNED AROUND GLOBAL FOOD PYRAMID. THE ACTIVITY HELPED STUDENTS GAIN DEEP INSIGHT TO THE FACTS REGARDING HEALTHY EATING HABITS. THE ACTIVITY WAS SLATED FOR THE MONTH OF MARCH, BUT BECAUSE OF THE WINTER CARNIVAL IN THE SCHOOL, WE MADE IT A PART OF OUR WINTER CARNIVAL AS WELL HELD IN THE MONTH OF FEBRUARY. CHILDREN HAD AN OPPORTUNITY TO THE EXPOSURE OF THE GLOBAL FOOD HABITS AND LIFE STYLES. STUDYING CROSS COUNTRY CULTURES AND APPRECIATING AND ACCEPTING THEM HAS BECOME THE WAY OF LIFE WITH OUR STUDENTS AT GURU NANAK PUBLIC SCHOOL. 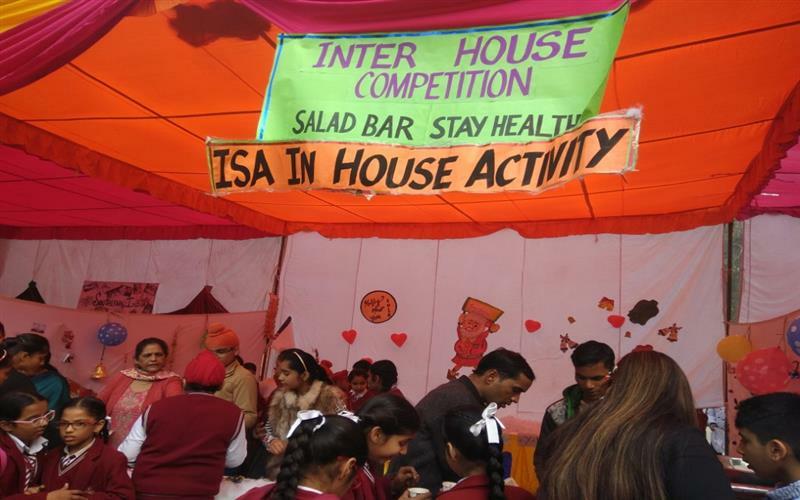 The Inter House Salad Bar Actvity was conducted for the students of the Middle Segment. Before the competition students did a lot of research work on salads of India, Japan, U.K. and U.S. This activity was devised in such a way that all the students from classes VI to VIII were actively involved and gained maximum exposure to food habits of different countries. They shared recipes with their peer group. This helped students to know about the culture, food habits, availability of food items in different countries. ISA IN- HOUSE ACTIVITY “ SALAD BAR ” WAS CONDUCTED FOR THE MIDDLE SEGMENT. DURING THIS ACTIVITY THE STUDENTS WERE INVOLVED IN SEARCHING ABOUT VARIOUS SALADS OD INDIA, JAPAN, U.K. AND U.S. THIS ACTIVITY WAS DEVISED IN SUCH A WAY THAT ALL THE STUDENTS FROM CLASSES VI TO VIII WERE ACTIVELY INVOLVED AND GAINED MAXIMUM EXPOSURE TO FOOD HABITS OF DIFFERENT COUNTRIES. STUDENTS PARTICIPATED WITH GREAT ZEAL AND ZEST. THEY SHARED THE RECIPES WITH THEIR PEERS AND GAINED KNOWLEDGE ABOUT NUTRITIONAL VALUE OF SALADS PREPARED IN DIFFERENT COUNTRIES. THIS HELPED STUDENTS TO KNOW THE CULTURE, EATING HABITS AND AVAILABILITY OF FOOD ITEMS IN DIFFERENT COUNTRIES.THIE ACTIVITY SHOWCASED A LOT OF RESEARCH WORK BY THE STUDENTS AND HELPED THEM INCREASE THEIR KNOWLEDGE ABOUT THE COUNTRIES UNDER SUBJECT.